If your water is starting to taste off or your refrigerator has a small light that turns red when it’s time to replace your filter, you don’t have to call in an expert. Replacing your refrigerator’s water filter takes just a few minutes and doesn’t involve any tools besides the replacement part itself. Follow these steps to replace your water filter in just a few minutes with the part #EPTWFU01. Turn off the ice maker. 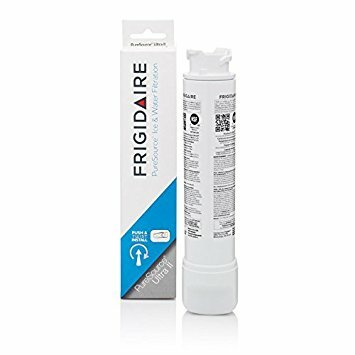 It can automatically pull from the water supply line when left running, which will result in water leaking into the filter’s housing during the replacement process. Find the water filter. It will be in the back right corner of the refrigerator’s interior, held within a long plastic tube. Remove the old water filter. Twist the handle counterclockwise to release the filter and remove it from the plastic housing. Insert the new water filter. Lock it into place by turning it counterclockwise until you hear a light snap. Clear the air from the filter line. Fill a glass of water through the water dispenser to ensure the system works, and check the water filter’s housing for any leaks. Flush the system. Run the water dispenser for approximately four minutes to thoroughly flush the system and remove any poorly filtered water through the system. Restart the filter timer. Most refrigerators have a light that informs you when it’s time for the filter to be changed. Follow your model’s instructions to restart the timer and change the light back to green so you will know when it’s time to change the filter again. Replacing your water filter keeps your water safe to drink. Even if you’re confident in your county’s water supply, this additional filter helps clean the water from any potential deposits that the water may have picked up through the city’s system or through the appliance. For more refrigerator and appliance repair tips, reach out to Appliance Express here.